Oh wow there are many times where I think CF has been real!! I think it's mostly when things don't go as planned is when CF gets real!! First hospitalizations, first hemoptysis, huge drops in lung function. I think the moment CF became really real for me was when some of my closest CF friends that I had grown up with had passed away. At that particular time in my life my own lung function was dropping at an alarming rate as well and I was going in the joint 6 to 7 times a year. I was hyper compliant, however, it still wasn't enough to keep CF at bay. CF is scary, it's hard not to always be fearful of CF, especially since you never know when CF will strike. I think it's ok to be scared of something so scary. I have thoughts of fear every day about something scary that pertains to CF. Living with fear lurking over you can be very daunting at times. However, I try not to let fear decide my fate... If you can become fearless, your life can be limitless. We all have fears, our fears help develop our courage... It might not feel like it but our fears really make us stronger. After many years of my health being unstable I had to take a step back and reevaluate my life. I finally had to make the hardest decision of my life, or rather the decision was made for me, when I blew the lowest pft ever; I was so sick. I had to to stop working it was literally killing me. Stress and CF do not mix well at least for me the mixture is toxic. It wasn't easy, I felt like my career was my identity. I had to reinvent myself and focus solely on my health. I changed my diet, started a trial where I was granted early access to Cayston and I started taking many supplements. My lung function finally started to remain stable. I was able to start staying out of the joint for longer periods of time. Although it was the hardest decision I have made, it was the best decision. It saved my life. I wish people understood CF and what we all go through. How much time is actually spent behind the scenes of CF. Everyone always sees us after our treatments. When we are ready to go, or when we show up. They don't see us when we can barely get out of bed or when we are doing hours of treatments or hours of sterilizing, coughing until we pee or throw up. The invisible part of CF is a catch 22. It's good so that CF doesn't always have to be the center of attention and you don't get treated differently, but also sometimes it can be hard because we don't look sick and people have high expectations. See the catch, its hard to describe. I am on full time o2 so the invisible part isn't so invisible anymore for me. I think the catch 22 applies more to my adult years. When I was growing up, I feel like I had a pretty normal childhood. I was diagnosed at 11 months old, there wasn't much to treatments back then, I mostly just got pounded everyday and was very active. I didn't start taking enzymes until I was 8, and my first nebulized treatments weren't available until I was in 8th grade. I didn't tell many people growing up I had CF because I never wanted to feel different or be treated differently. I would go in the hospital for clean outs over Christmas break so I wouldn't miss much school and when I got back I just told everyone I was out of town. It's so different in today's world. These kiddos have so many treatments to do and all these meds that are available, which is so amazing because the medical advancements have been life changing and these kiddos are going to grow up and have long lives. They are my heroes they go through so much! I had a difficult time gaining weight when I was a teenager. I think I was 15 and there were talks of NG tubes and how we could get me to gain some weight. Bribes went far and I made a deal with my mom and everyone at clinic that if I gained 10 lbs by my next appointment I could get my belly button pierced. I'm not sure my mom was too crazy about that idea. But I wanted it done so bad. I drank Ensure after Ensure took enzymes throughout each can, and ate so much ice cream. My belly button is still pierced to this day. It acts as good reminder that I can accomplish things when I put my mind to it. Do you have any goals or aspirations for the future? That is exactly my hopes and dreams for Love To Breathe® which was established in 2001. 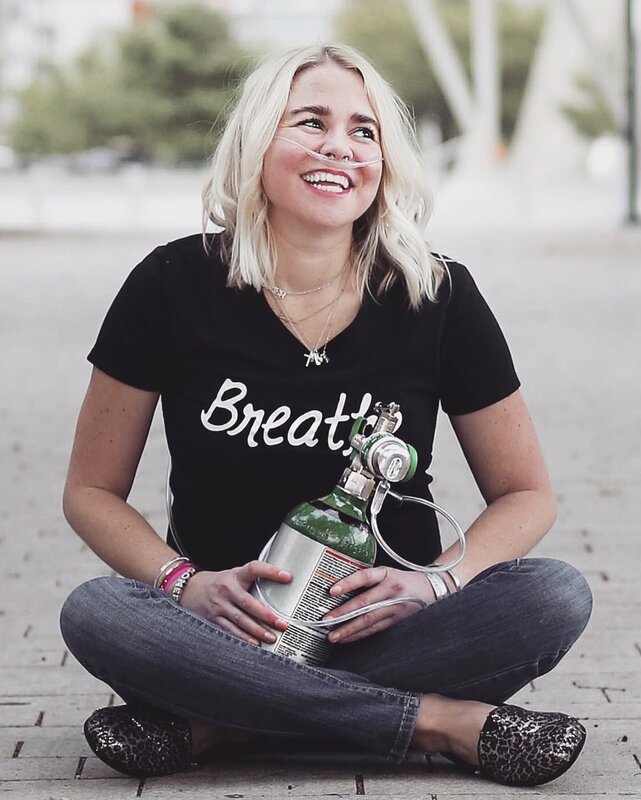 I created Love To Breathe® so I could give hope and positive energy to the Cystic Fibrosis community, especially to the families with newly diagnosed children. ﻿I believe it is important to educate and raise awareness about CF and spread Love whenever and wherever I can. Right now there are about 8,500 Love To Breathe® Tokens circulating around the world. I'd love to see that number grow. They are in over 68 countries and all the states now, its been such a rewarding project. Knowing that each token has had an impact on someone means the world to me. I love checking the hashtag #LoveToBreatheTokens and seeing if any fun pics pop up. One of my many passions in life is painting and writing. Living in the moment and making each breath count is the best way I think anyone can live life. When I am painting and writing it seems to me I am doing just that. These outlets are so healing and very therapeutic for me, and help me deal with stress and certain anxieties CF can cause. I have a goal of finishing a book I started and maybe one day getting that published. For now though, I'm just focusing on taking each day as it comes, living in the moment and giving back to a world that has given me so much. Making a difference in others peoples lives makes me feel good and in turn makes a difference in my life. I am truly blessed and so grateful for every breath I breathe.